Make a toy to keep your horse entertained in their stall! 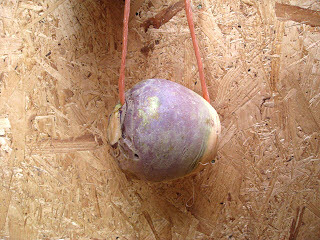 Drill a hole vertically through a swede or rutabaga. Thread a rope through the hole, then tie the ends of the rope together. Hang the toy in your horse’s stall. Ensure that the height of the toy and the size of the loop are not such that your horse could get a hoof or their head stuck in it.